Cikgu MIDAD's missADVENTURES....! 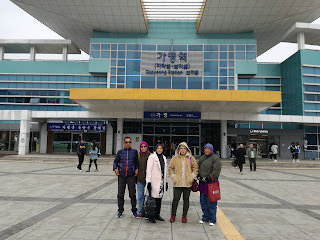 : KTO TOUR EXPENSES AND CHEAPER ALTERNATIVES....! I was lucky that everything during the tour was paid for by Korea Tourism Organisation. If I were to pay all those entrance fee, food, performance, rides, flight tickets and accommodation, than I would have to fork out quite a lot of money! Here’s a breakdown of the total cost if I were to pay for it myself. The price/fare/cost is based on the current information found on the internet. The exchange rate at present is 1000 Korean Won = RM 3.39. Air Asia flight is cheaper! You can cut down on your expenses by buying cheap Air Asia tickets and book strategic guest houses much earlier. You should visit all the places that are without any or small entrance fee and select several attractions that you can afford. You can always go back to visit the rest in the future....! The only thing missing from this list of expenses is the daily / local transportation – train/subway, bus or taxi. That would require you buying T-money card (similar to Touch n Go card) which can be used on most of the public transportation. Now this requires a different blog entry altogether....!